The T3 HMC is an American tier 2 tank destroyer. Light SPG for infantry and tank support. Developed in 1938 on the M1A3 chassis. Only one prototype was built. The trials demonstrated a number of technical and functional problems, and the vehicle never saw service. The T3 HMC is replaces the T18 as the tier 2 American tank destroyer after the latter was moved to tier 3 and pushed into the artillery class. The T3 is lightweight and fast, undeniably the quickest of the tier 2 tank destroyers. 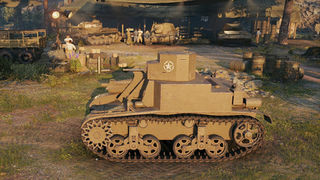 This speed allows it to rapidly respond to changing battlefield conditions, quickly bringing one of two tier 4 guns to where it can be most effective. Due to its low armor, however, it is fragile and easily damaged, so care must be taken to avoid destruction. The T3 HMC leads to the T56 GMC. The T3 HMC serves as the tier 2 American tank destroyer, replacing the old T18. Unlike the vehicle it replaced it is fast, agile, and thinly armored. In this way it plays more like the T82 did when it was the tier 3 tank destroyer instead of a tier 4 SPG. 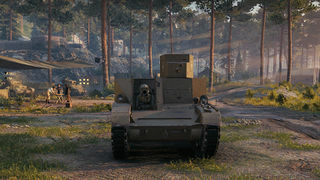 Players who remember that vehicle will have some familiarity with how the T3 handles as a result. The T3's main hallmark is its speed. With a high top speed and horsepower/ton ratio, it can quickly reposition itself on the map or flee a bad situation. It also has a choice of two decent guns, with the QF 2-pdr Mk. IX allowing it to deal consistent damage with good penetration, while the 75mm AT Howitzer M1A1 gives it the best alpha damage of its tier, even surpassing the AT-1. The choice of gun also dictates how best to play the T3. With the QF 2-pdr, it's best to stay at middle range and use its rate of good rate of fire to pile on damage. The inverse is true with the 75mm howitzer--the best choice then is to take the T3 closer, and preferably onto the flanks of opponents, to hit them from the sides with 175 High Explosive damage. Both guns also feature very high penetration on their APCR and HEAT ammo. It buys this speed and firepower at a price. Its armor is poor--though not as thin as the Universal Carrier 2-pdr--and mostly flat. Its view range is horrid, at 270 meters--second worst only behind the AT-1 in its tier and class. It also suffers from a very weak radio with a range of just 265 meters and no option to upgrade. This means that it has to stay nearer to the front to make the most of its allies' spotting ability. Optics of some kind are almost mandatory--binoculars are probably a better choice, as coated optics would only extend its range to just 297 meters. 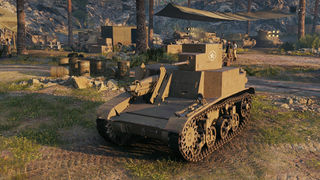 The T3 is not a bad little machine, and in spite of its shortcomings it is a lot of fun to play thanks to its high speed and good firepower. It's good early training for the fast, powerful, but fragile mid-tier American tank destroyers, such as the M8A1, T67, or Hellcat. With so few choices, research the QF 2-pdr. for improvements to penetration and damage. Research the 75mm howitzer for a big boost to DPM. Research the engine and suspension at your leisure. 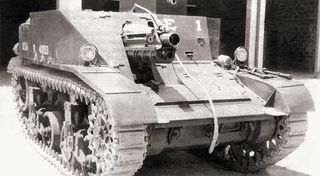 The T3 HMC, otherwise known by its full designation of the T3 75mm Howitzer Motor Carriage, was an early attempt by the United States Army to provide a self-propelled artillery piece by mounting an M1A1 75mm pack howitzer on the chassis of an M1 Combat Car (which would later redesigned as the "M1 Light Tank"). 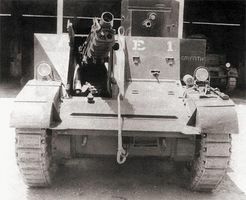 The old turret, which was centrally-mounted and carried two machine-guns, was removed on the T3 and replaced with a small turret offset to the left, which carried only one machine-gun (reminiscent of one of the mini-turrets on the M2A2 Light Tank, which mounted two of them side-by-side instead of a single turret).The howitzer, mounted to the right side in the crew compartment, was flanked by two narrow 'doors' for protection during transit, which could be opened to expand the gun's firing arc. The gun could still, in theory, be fired with the doors closed; however, the lack of any gun traverse meant that the gun could only be elevated or lowered from the position, and the entire vehicle would have to turn to track the gun from side-to-side. The conclusion made by the US Field Artillery command was that the tank was simply too crowded to function properly, even with just two crew members manning the HMC. The position of the gun in the crew compartment made the interior very cramped for the driver and commander, and it was impossible for the crew to offer effective and/or efficient support in combat in such tight conditions. 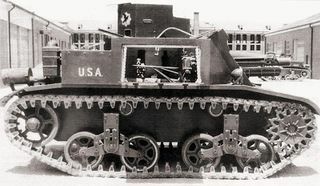 The Armored Force division examined the rejected prototype, hoping to press it into service as an assault gun; along with Field Artillery, they spurned it for the same reasons as before. Despite the failure of the model, data gathered from testing was useful in the development of the T18 HMC, although the new design was also regarded as unsuccessful. The T3 HMC prototype. The machine gun nominally mounted in the small side turret is not present. Note how the doors flanking the gun are closed; this severely limited the gun's tracking ability, as shown here. The frontal profile of the T3 HMC. The side doors are opened (and the gun can now move in a larger arc), and the designation 'E 1' is emblazoned above the closed driver's window (probably shorthand for 'Experimental, model 1'). The name 'Griffith' on the side glacis is possibly the name of one of the tank's designers, or a nickname given to the prototype. The side profile of the T3 HMC. Note the opening in the side to allow easier access to the crew compartment. An emblem of a bird is present on the MG turret's side, in the style of a cavalry badge (the M1 chassis was originally ordered for the US cavalry, thus owing to its 'Combat Car' designation). *Only the 75mm M1A1 pack howitzer was used on the T3. No other weapons were tested or even considered for this tank. This page was last modified on 23 October 2016, at 18:43.